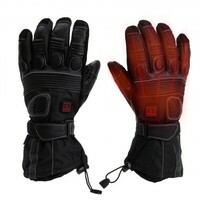 The warmest touring heated glove yet, the Heated Touring Motorcycle Gloves are great for year-round riding. With micro-alloy fiber heating elements strategically placed on top of the hand and fingers wrapping around the palm and thumb for maximum cover. An extra protective gel knuckle, palm, and finger cushions along with reinforced fingertips give riders the dexterity needed to keep the cold air out on cold winter rides. The Heated Motorcycle Touring Gloves are constructed with premium Nappa Leather and a waterproof membrane, to keep hands protected and warm while out on an adventure. These heated motorcycle gloves also feature a form fitting adjustable hook and loop strap with an adjustable hem cinch on the wrist to create a personal microclimate. Each glove index and thumb have touch screen capabilities so that users can pull over and use touchscreen devices without taking the gloves off. Once the Heated Motorcycle Touring Gloves are plugged in, turn on the heat with the simple touch of a button (hold for 2 seconds) and enjoy comforting warmth throughout the hands- combat mother nature to keep the adventure going!